Dino balloons! 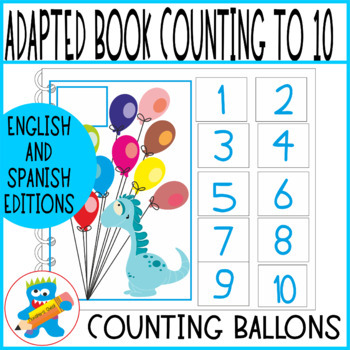 Counting to 10 Adapted book. Hands-on learning. If you want to follow Monster's Chest click here to get to know about new releases, special offers and freebies. You can also find Monster Chest in Facebook, Instagram and Pinterest. You only have to print the 7 pages, cut, laminate and re-cut them, to have 10 pages and a cover. Don't cut the last page. 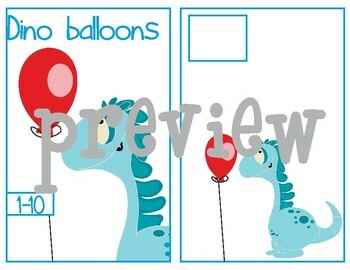 In the first 6 pages, you will find the cover of your book and 10 inner pages with a dino and some balloons. In the last one, you will find the back cover, so you can velcro the numbers from 1 to 10 on the right side there. Organize everything and bind it. 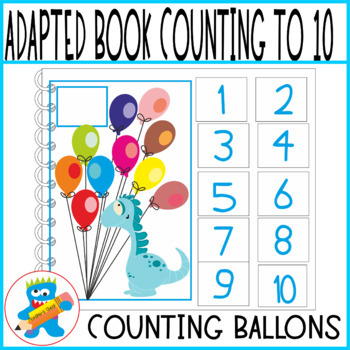 The task consists of counting the balloons and searching for the correct number. Da clic aquí para convertirte en seguidor de Monster's Chest, para enterarte de todas las novedades, ofertas especiales y productos gratuitos. para contar del 1 al 10 Globos de dinosaurio. El archivo tiene 7 páginas. En la página 1 encontrarás la portada y los números del 1 al 10. Corte por la mitad las siguientes 5 páginas, y deja el número 7 tal como está. Recorta los números. Lamina todo. ubicados en la esquina superior izquierda. colocar los números del 1 al 10) Versión completamente en español incluida. ¿Te gustan los libros adaptados? Aquí tienes uno en español para trabajar inicios de palabra con vocal.